PFLAG’s work started with one mother who changed the world when she raised a homemade sign and her lone voice in public support of her gay son. In speaking up, her voice helped change the world and inspired others to act as well. For over 40 years, more and more families and allies have united with lesbian, gay, bisexual, transgender, and queer (LGBTQ) people across the country, uniting in love and working toward the common goal of civil rights and equality for all. Each time another voice is raised – whether offering support, providing education, or advocating for equal rights – the PFLAG legacy continues. PFLAGers and equality advocates from across the country will converge in Portland, OR in October 2017 to honor and build on that legacy at our biannual national convention, We Are the Change. 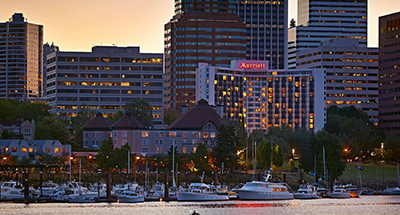 We are proud to host the event at the Portland Marriott Downtown Waterfront. Marriott International has been a longtime supporter of PFLAG, and committed partners in the fight for equality and the goal of creating and maintaining a strongly diverse and inclusive workplace...and world. Thank you to our convention sponsors! We are the Change. Together we will learn new skills, build relationships, and shape the future of the movement for LGBTQ equality. Registration now available at a discounted rate of $275 for PFLAG members ($350 for non-members). PFLAGers and equality advocates from across the country will join together for We Are the Change: The 2017 PFLAG National Convention in Portland, OR to honor and build on our legacy at our biannual national convention. They’ll learn new skills, build relationships, and shape the future of the movement for LGBTQ equality. The full schedule of workshops, including workshop descriptions and presenter information, is now available! This information, including the full schedule and workshop descriptions, will be available for all convention attendees in the program book that they receive on-site. Help PFLAG save natural resources and please consider the environment before printing. Read descriptions of all of the workshops during this block or check out the workshop descriptions and presenter bios that you're most interested from the list below. If you have any questions or need additional information please contact proposals@pflag.org. And if you're as excited for these learning opportunities as we are, register today and join us in Portland, OR for We Are the Change: The 2017 PFLAG National Convention. On Saturday, October 21 at 5:10 pm you are invited to join us in the Oregon Ballroom at the Portland Marriott Downtown Waterfront for our first-ever PFLAG Table Talks! This exciting networking and sharing event helps you be part of solution-focused dialogue about issues that will help PFLAG members build a better future in communities nationwide. Share the challenges you’ve faced, the ways you’ve risen above, and the remarkable progress you have made to support, educate, and advocate for people who are LGBTQ, their friends, and their families. Learn better practices from the experiences of chapter members and leaders from all over the country. Talk about how projects and programs might need to be adapted to meet the needs of your community. Coalitions: Who do you work with? Please join us at the 2017 PFLAG National Convention and get to know the PFLAG National Board Vice President and Regional Directors Chair, Kathy Godwin as well as PFLAG’s Regional Directors Council and staff during these one-of-a-kind table talk discussions. Let us know you're coming: Register. In 2015, we launched PFLAG Gives Back as an integral part of our biennial convention. Now we have the opportunity to make an even greater impact! Thanks to the generous support of Subaru, our underwriter for PFLAG Gives Back, we will offer three unique, on-site, opportunities to donate time, talent, and treasure to help others in need. We would also like to thank Walmart for their generous funding that helped make all of this possible. Have extra space in your suitcase? PFLAG will host a donation drive to benefit New Avenues for Youth. The greatest needs heading into the rainy season are: toothbrushes, toothpaste, other toiletry items, new socks and new underwear, and back-to-school supplies. You can drop your donations off in the Pearl room, 2nd floor, on Saturday or Sunday. Looking for one more way to give back? We’ll have a space set up (also in the Pearl room on Saturday and Sunday) to create holiday cards and love notes for youth accessing services at the Sexual & Gender Minority Youth Resource Center (SMYRC). If you have any questions please contact Jamie Henkel (jhenkel@pflag.org). 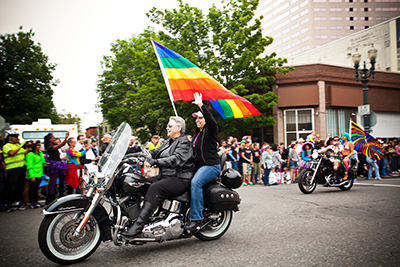 With close to a dozen chapters across the state of Oregon and with PFLAG Portland as our host, there are so many things to love about this big city with the small-town feel. 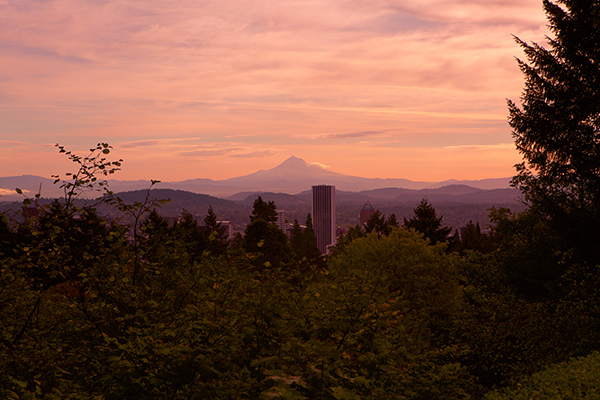 The City of Roses--Oregon’s largest--sits on two rivers just below the majestic beauty of Mount Hood, and boasts a whole host of parks, bridges and bicycle paths, plus a thriving cultural scene full of art, live theatre and music, and more. 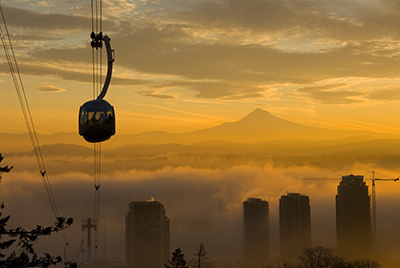 Portland is also known as a fantastic getaway for anyone who enjoys natural beauty. 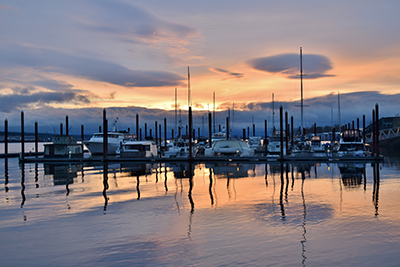 A short distance from the Columbia River Gorge and Multnomah Falls, the city hosts excellent wineries, fish watching at Bonneville Dam, and all of the excitement and beautiful views of the Oregon coast. Portland also has an extensive park system which includes the elm shaded South Park Blocks in the downtown area, Washington Park, home of the Rose Test Gardens, Mount Tabor, an extinct volcano, and the biggest park, Forest Park, which is the largest park within a city in the U.S. From the over 4,600 acre Forest Park to tiny 24 inch Mills End Park, Portland's park system offers leisure and recreation opportunities for everyone. 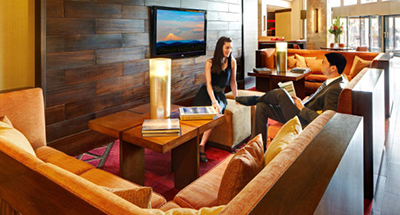 Our longtime partners, Marriott International, are once again setting the stage for a fantastic national convention, with a beautiful location, and a rate--$149/night--that can't be beat! Rates are available until Tuesday 9/26 and will not be available after that date. 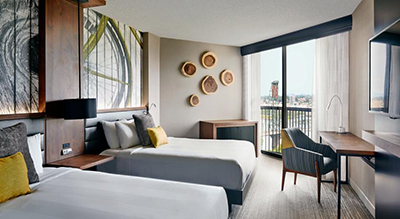 Set along the Willamette River, the Portland Marriott Downtown Waterfront features a bold look that celebrates the city’s love of nature and its forward-thinking appeal. In the Greatroom, connect over free Wi-Fi and handcrafted cocktails, and enjoy a meal with PFLAG friends old and new at Bistro by Truss, with its locally inspired menu, and long list of fine bourbons and whiskies. 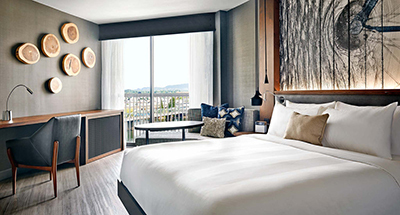 Redesigned guest rooms feature locally inspired art, platform beds, multi-use surfaces and spa-inspired bathrooms with a granite countertop and walk-in waterfall shower. 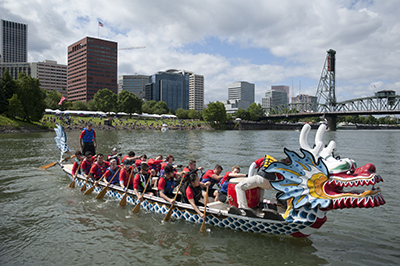 Our hotel in Portland, Oregon offers easy access to top attractions, Portland State University and the outdoors at Waterfront Park. A downtown location makes it the perfect spot for the PFLAG National Convention. PFLAG National is thrilled and honored to present Father James Martin, SJ, with its 2017 Flag Bearer Award at the 2017 PFLAG National Convention in Portland, Oregon. The Flag Bearer Award is given in acknowledgement of the accomplishments of individuals, businesses, and organizations that have made lasting contributions to the safety and/or equality of people who are LGBTQ, their families, and allies. The work must occur outside of the PFLAG structure and demonstrate a significant impact. “At a time when religion is too often manipulated to become a tool of discrimination and hatred, I am delighted and excited that we will elevate Father Martin’s healing and powerful voice at the 2017 PFLAG National Convention,” said Jean-Marie Navetta, PFLAG National’s Director of Learning and Inclusion. 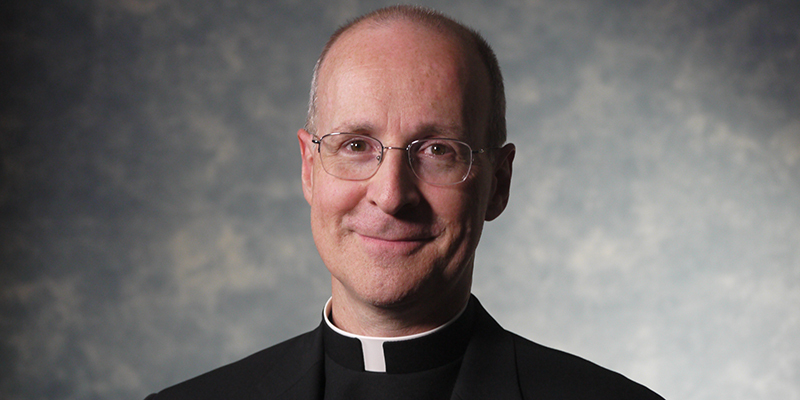 Father Martin, is a Jesuit priest, editor at large of America magazine, consultor to the Vatican's Secretariat for Communications, and author of numerous books, including The New York Times bestsellers Jesus: A Pilgrimage and The Jesuit Guide to (Almost) Everything. Father Martin is a frequent commentator in the national and international media, having appeared on all the major networks, and in such diverse outlets as The Colbert Report, Fresh Air, On Being, Fox & Friends, PBS's NewsHour, The New York Times, The Wall Street Journal, and The Boston Globe, as well as on the History Channel, BBC, and Vatican Radio. Before entering the Jesuits in 1988, he graduated from the Wharton School of Business. His most recent book, Building a Bridge: How the Catholic Church and the LGBT Community Can Enter into a Relationship of Respect, Compassion, and Sensitivity, has received widespread praise. More importantly, it is a shining example of the power of faith leaders to unite those who have too often been on opposite sides of a conversation and haven’t often seen a path forward to truly seeing each other, achieving unity, and experiencing the blessing of healing. In August 2015, PFLAG Charlotte launched an affiliate support group called Transparents of PFLAG Charlotte. Since its inception Transparents has grown from two moms in need of information and support to include 30 families throughout Mecklenburg County. The group hosts quarterly social events for families with trans and gender creative children to help assure families and youth that they are not alone. They have also hosted fundraising events for the local LGBT center in Charlotte to help ensure that community needs are being met. Transparents has helped to establish PFLAG Charlotte as a trusted coalition partner on a variety of issues. Members of Transparents have worked in partnership with Equality North Carolina and participated in advocacy efforts around the repeal of HB2. Their stories have been featured in local news outlets including The Charlotte Observer, NPR Charlotte Talks, and WBTV News. They have also collaborated with Time Out Youth, a program of the Charlotte LGBT Center, to organizing meetings and events focused on creating safe schools with teachers, school board members, and the superintendent. In 2016 and 2017 Transparents of PFLAG Charlotte secured grant funding for a healthcare outreach campaign focused on educating pediatricians and family medicine providers about the importance of providing affirming, culturally competent and supportive care to trans-identified youth. This project has allowed Transparents to work with the Mecklenburg County Medical Society and the Carolinas Healthcare System, as well as with individual physicians, nurses, and therapists. They have distributed literature, conducted training, and provided one-on-one consultation. Established in 1990 PFLAG Orlando has a long history of providing support, education, and advocacy in the community and currently has more than active 60 members. 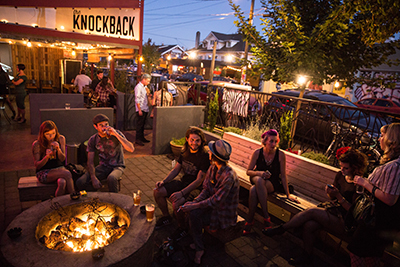 Their efforts have adapted and shifted over times to accommodate changing community needs. For example, like many chapters, PFLAG Orlando members regularly table at events such as the Central Florida Fair, Gay Days at Walt Disney World, and Come Out with Pride. Recently they begun distributing business cards with information on how to access an app they have developed that links to the chapter Facebook page and PFLAG literature. They are in the process of updating and expanding the chapter website, adding bilingual capacity to their telephone helpline, and creating a YouTube channel. Additionally, on June 12 when 49 men and women lost their lives at Pulse Nightclub, PFLAG Orlando members sprang into action. In the immediate aftermath, as the story was still breaking, one PFLAGer went to the area where families were gathering to translate police communications. The chapter’s June support meeting was three days after the shooting and chapter leadership ensured that a mental health professional was available to talk with attendees. Others made sure the mobile app had up to date information from city authorities. Many attended memorial services for the victims in the days and weeks after the shooting. Additionally, many of the donations that PFLAG Orlando received from around the world have been shared with coalition partners and organizations that serve Latino and LGBT families in Central Florida. PFLAG San Gabriel Valley is a chapter that serves the Asian and Pacific Islander community in and around Los Angeles County. They began meeting as an affiliate support group of PFLAG Pasadena in April 2012 and became an independent chapter in May 2013. The chapter has adapted PFLAG’s support model in order to accommodate the culture-specific needs of Asian-American, Pacific Islander, East Asian, and South Asian families. They do their best to foster inter-generation dialogue, provide language assistance, and host afternoon tea, potlucks, and private family circles to meet the needs of their community. The chapter recently hosted a dinner for 30 PFLAG parents from China who were visiting the US. Additionally, PFLAG San Gabriel Valley has done amazing outreach in their community and established their chapter as a trusted coalition partner with the support of grant funding. Each year they march in the Los Angeles Golden Dragon Lunar New Year Parade as well as pride parades in Long Beach and Los Angeles. They have also helped to organize and support community events such as the API LGBT Youth Summit, the Creating Safe Faith Communities convening, and Okaeri 2016: A Nikkei LGBT Gathering. Members of the chapter also participate in various events and conferences, including the EDGY Conference, Models of Pride, and Asian American Mental Health conference as presenters and panelists. The chapter has also created outreach videos to promote the chapter, allow families to share their stories, and support the LGBT API community nationwide. Engage with a powerful network of 500-plus PFLAG leaders and members who are changing the world. Our 2017 PFLAG National Convention sponsorship packages are designed with maximum return on investment (RoI) and social impact in mind. To explore a customized program to support the branding needs for any budget, please contact Elijah Perry, Corporate Development Manager, at eperry@pflag.org or (202) 684-9891. We are the Change 2017 is a unique opportunity to reach hundreds of PFLAG members and partners, all of whom are working to change the world. Whether you are a chapter offering new resources, a member wanting to share personal resources that you’ve found helpful, or a partner organization looking to invite PFLAGers to further collaborate, this year we are offering more opportunities than ever to create interaction, spark new ideas, and offer invaluable information. A special section has been designated for PFLAG chapters and members to share their great ideas and innovative approaches to creating materials that could be replicated by other chapters. Merchandise and materials must be PFLAG related, and the chapter is responsible for bringing their items including marketing and pricing information. To make sure you're reaching convention goers, please provide contact information in a visible (written) format. On site sales are not permitted, however contact and order information can be shared. Consider providing photographs or sample items of different sizes marked with prices so that conference goers can make selections when placing their orders. PFLAG Chapter Experience Display rate: Free! Please indicate the materials you plan to bring on the sign-up form. This year, we are also offering exhibit booth space opportunities to our non-profit and corporate partners. A limited number of spaces, in a high visibility and foot-traffic area, are available for nonprofit and corporate partners of PFLAG and then on a first-come first-serve basis only. These spaces are not available to sell merchandise. Exhibitor is to furnish all equipment, inventory, supplies, and personnel necessary for the operation of their space. There will be no charge if you are ok with sharing table space with other presenters looking to showcase their materials. No sales are allowed in this space. For information about all exhibit booth opportunities, please contact Elijah Perry at eperry@pflag.org or call (202) 467-8180.